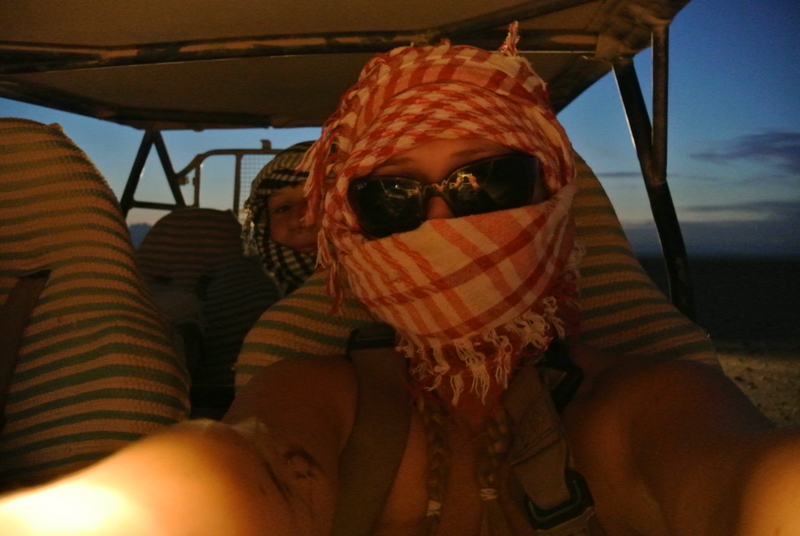 After we had returned to Badawya from visiting the Bedouin camp by Jeep Safari (see earlier post), earlier in the day, the children were taken to see reptiles, a tortoise and other desert creatures whilst I went to ride a quad bike through the desert. The minimum age for this was 16, which my 13 year d was slightly miffed about. I could have taken one of the children on the back, but since I had 3 children, I didn’t think this very fair. On the plus side-they really enjoyed seeing the lizards, python, tortoise, etc; some of which they were able to touch. 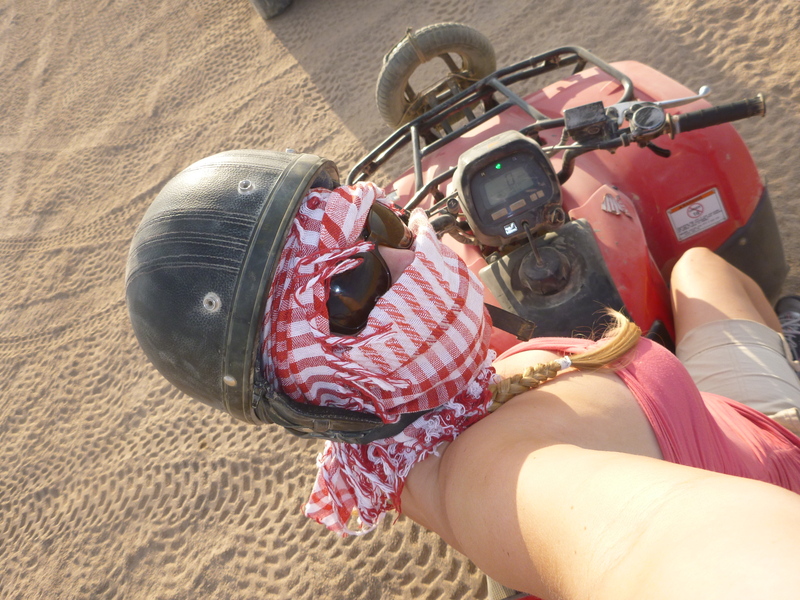 Meanwhile, I was scarfed up Arab style for my quad bike safari. 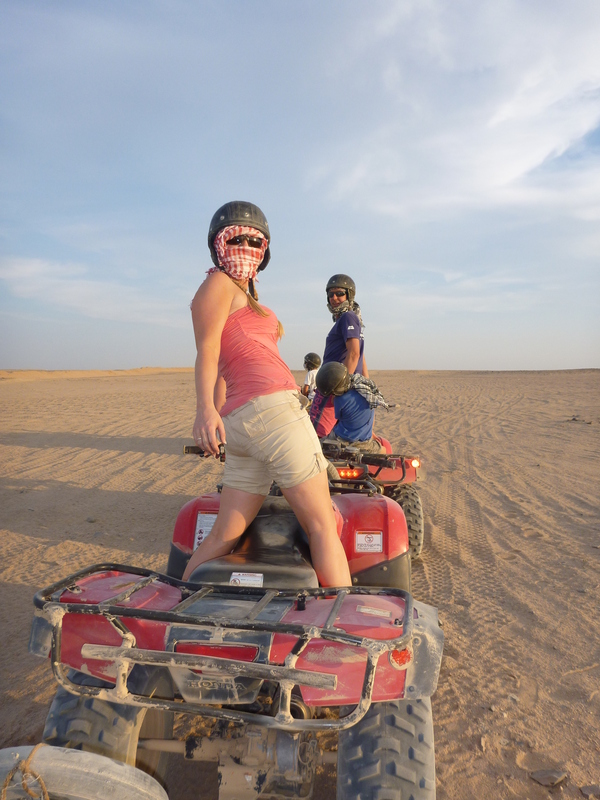 I was shown how to use the quad bike, which took all of 20 seconds and then we were instructed to follow the leader in a follow-the-leader-snake of bikes. Initially, our tour guide indicated that we may be separated into 2 groups-one of which would be the faster drivers… Being the competitive girly that I am, I quickly found myself trying to race the others, and overtaking which I was reprimanded for. In the end, we weren’t divided as a group, and we were all told to keep up with the leader. This was a blast. 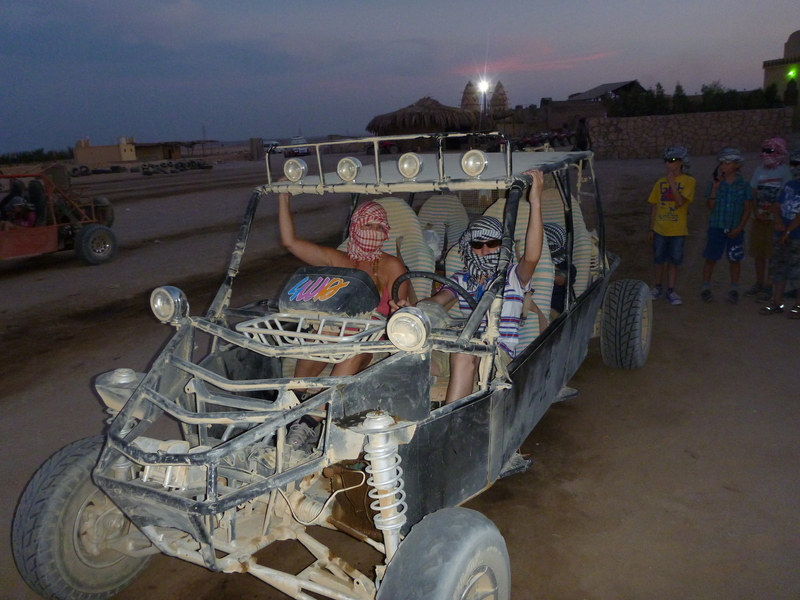 We powered through the desert, bumping over the sand dunes. Despite my head scarf and large sunglasses, my face was so caked in sand that I could feel it in my nose, my mouth, and pretty much everywhere else you could imagine, I found myself standing on the bike and squeezing with my knees like the tour leaders were, not to show off but to try and reduce the bumps to my but as we bounced hard over the dunes and the sand that could reach my face. It was literally a strain to keep my eyes open and see through the clouds of sand (despite my making it into third position in the queue). The highest speed I noticed myself clocking was 64km per hour. I have to admit; at those speeds, I was rather glad I hadn’t taken any of the children on the back of my quad bike… We were wearing crash helmets, but most of us were wearing only shorts ad teeshirts, and at those speeds I hate to imagine what could happen if a child let go or had a lapse in concentration. I can definitely see why the age restriction was in place! 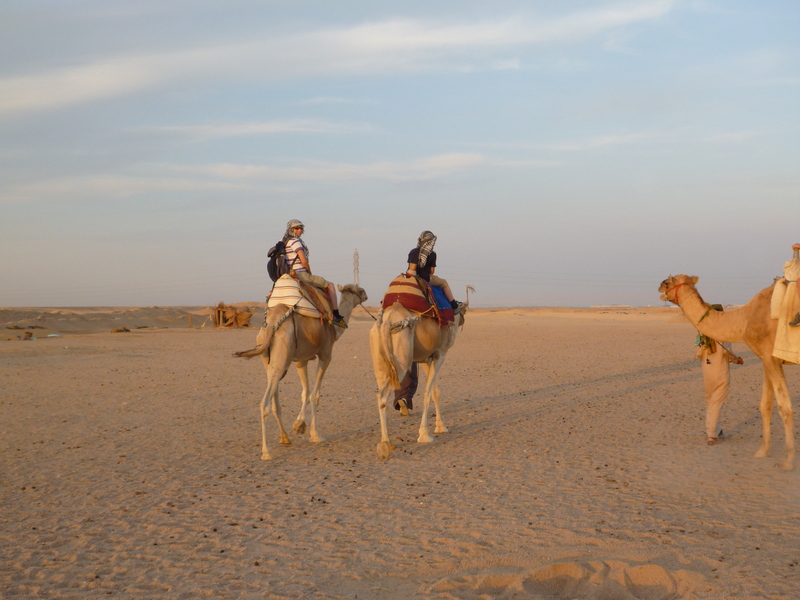 Upon our return, our group were led off to ride camels, horses and donkeys. 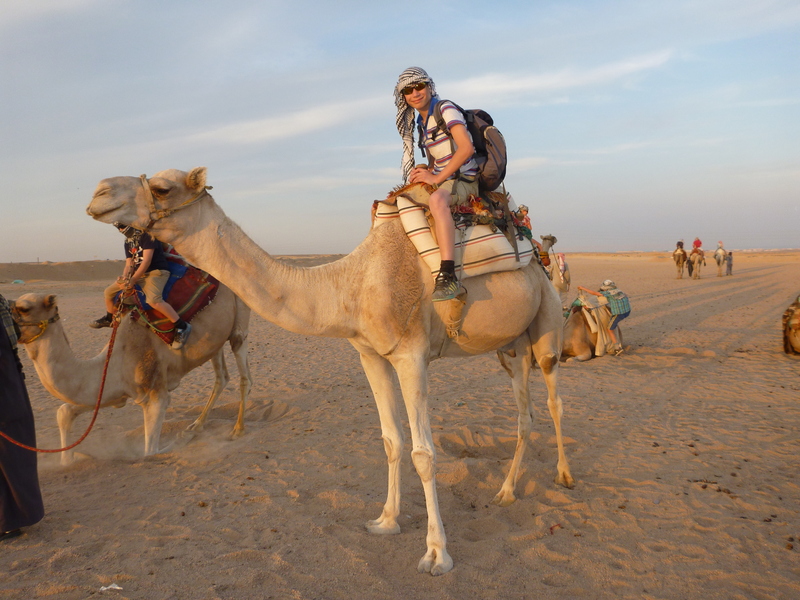 Camel riding is not the most comfortable ride in the world-I certainly wouldn’t fancy having to traverse miles and miles through a hot desert on a camel. Getting on was fairly easy, as they lie flat to the floor on their knees. However, has they stand, you are almost tipped off over the camel face first as it raises it’s front back legs first, and when it lays down again, you are practically catapulted off again as demonstrated by my younger son in the picture to the left here who is struggling to remain seated as the camel rises to stand. …Quite funny to watch! Having observed this-I leaned away from this each time, pulling my daughter to lean with me (as she was sat with me). The camels were much cleaner than others I have seen abroad, and didn’t stink to high heaven either, which is always a bonus. 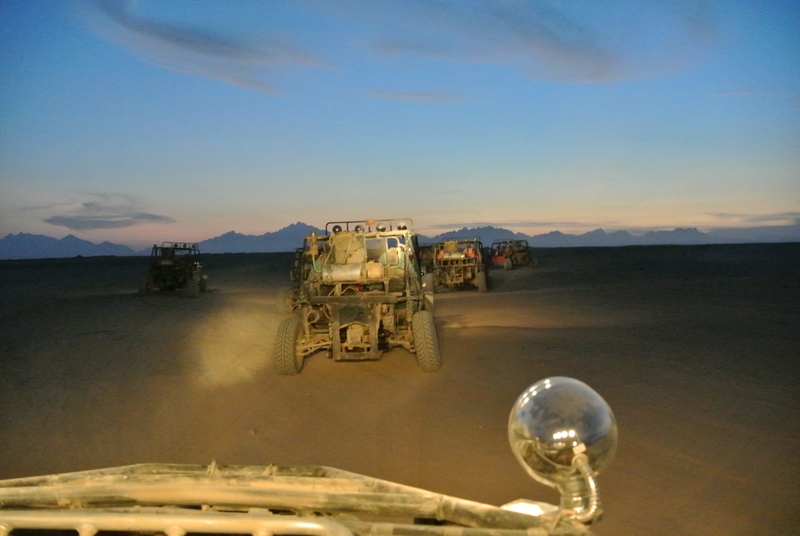 Unfortunately, I think our tyre blow out on the Jeep safari, may have delayed our progress through the activities, and by the time it came to our spider car due buggy rally, it was becoming very dark. My family and I were all allocated a car with my younger son and daughter behind and my older son, Harry, and I in the front. 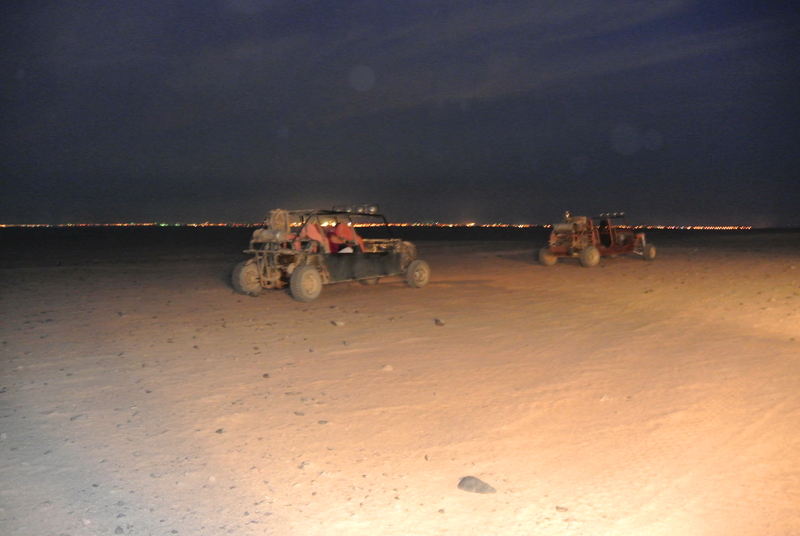 We alternated driving so that we both had a turn, and they stuck the high beam spot lights on our dune buggies on to improve our chances of seeing where we were going… I say improve because again, with the sand that was being kicked up, and the lack of natural light, it was incredibly hard to see anything except a vague haze of light from the sand and dust cloud (dune buggy) in front of us! It was undeniably brilliant, but I was actually quite to get back to the camp after our 30 minute jaunt, as we returned under a black sky. I think this would have been such a better day if they had just collected us 40 minutes earlier from our hotel. This would have given adequate time to allow for any issues like the burst tyre we experienced on the previous Jeep Safari earlier in the day. and a strong man type of show where a heavy-weight man walked on broken glass and lay on a bed of nails. This was a fantastic day out and compared to the other day trip excursions was great value for money… If you are thinking of booking-this company do it for about £33 per adult and roughly half that for children under 13. I managed to include my 13 year old son in that price. 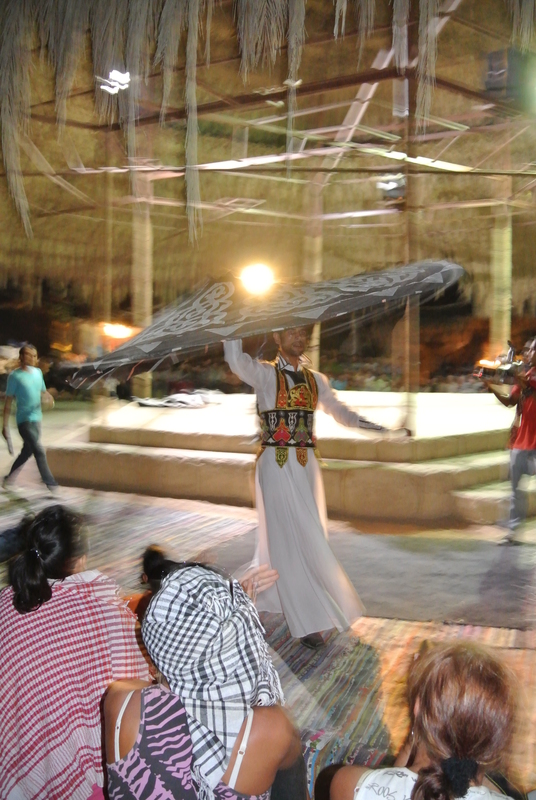 I booked through Red Sea Holidays at the hotel and paid significantly more… In fact-I paid well over the odds for all of my excursions, as I discovered to my detriment when I went into Hurghada… Moral of the story? 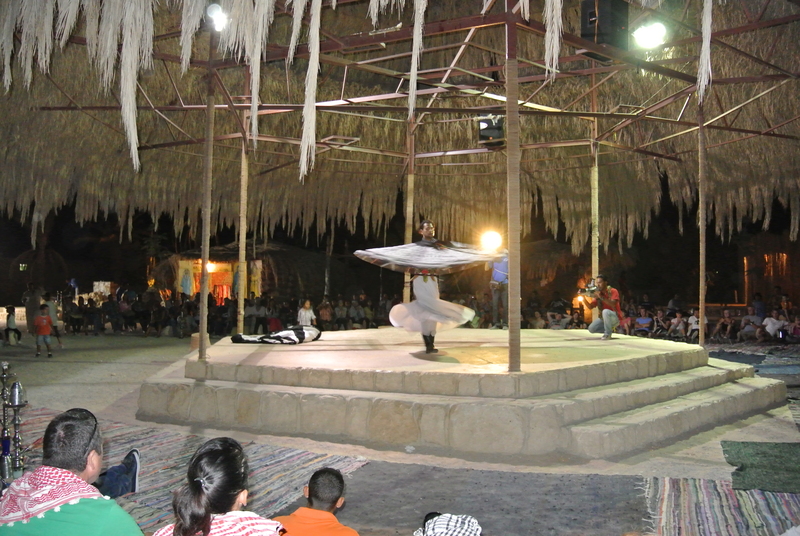 If you are staying at a Red Sea Hotel (I stayed at The Grand Makadi, but the same appies to Sunwing, Sunwing Waterworld, Makadi Palace and Makadi Spa) don’t book at the hotel-go to Hurghada town and you will pay about half of the price that you can bargain the hotel tour reps down to! ← My Bucket List has been featured in Woman’s Own magazine! 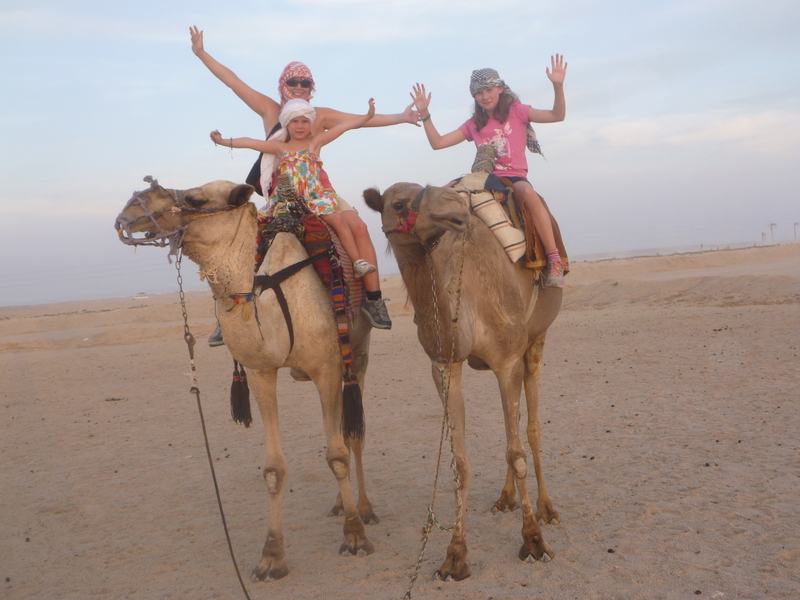 I hope you don’t mind, but I just thought I’d add for your readers that when we went on a camel ride in Egypt on our honeymoon, all the camels were led by Bedouin boys and girls. Although we could tip them if we wanted, the money would go straight to their family. Someone on our tour had been on the same trip before and had brought along cheap pencils, colouring pads, toys, long-date packaged sweets, etc from the UK so that the children would actually have something for themselves to keep and enjoy. Didn’t cost them much and wouldn’t have taken up much space in their suitcase on the flight over. Can I mention the company we booked our excursions through? 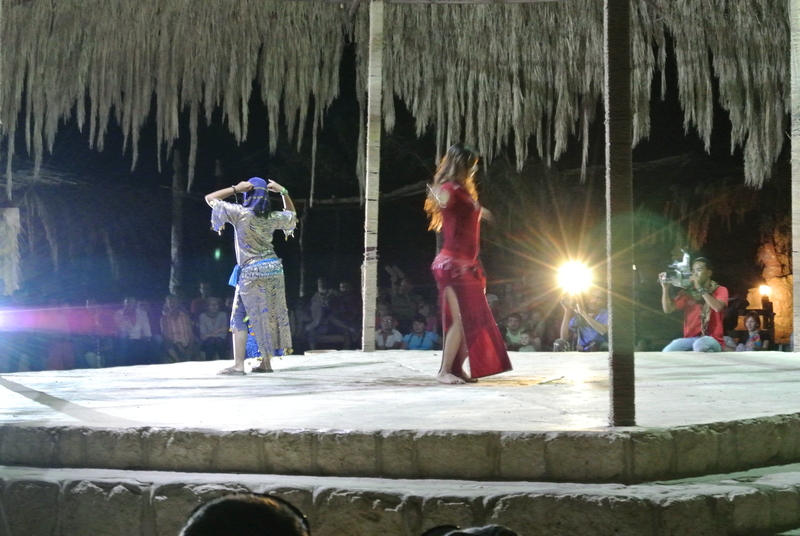 They were good value and cheaper than the hotel excursions (we booked several from the UK before we left) and the excursions we went on were really good. We stayed in Sharm-el-Sheikh. If course Liz! Go for it. Ours were led by men rather than children. The pencils are a really nice idea. The reason the money would go to the families is because the wages are exceptionally low out there… A teacher earns the equivalent of £60 GBP per month. I imagine the children have better tipping potential than adults and a pound for example is the equivalent of 3 hours wages. You start to understand their desperation to sell to tourists when you realise how rich we must seem.